Back in November 2012, Colin Kaepernick was named the starting quarterback for the San Francisco 49ers and there was plenty of controversy back then. In a sit down interview with Colin Kaepernick, former 49ers quarterback, Steve Young, speaks with Kaepernick and asks him to take us back to that time and what it was like for him. 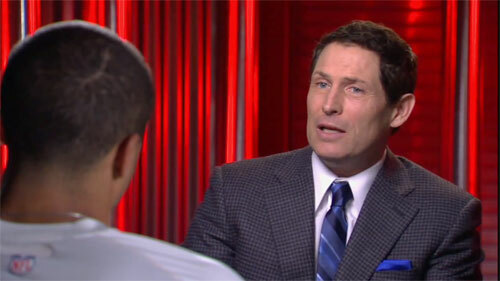 Former 49ers quarterback, Steve Young, speaks with Colin Kaepernick in 2012. Watch video where Kaepernick also talks to Young about his speed, running and Pistol formation. Steve Young played for San Francisco 49ers from 1987 to 1999. He was named the Most Valuable Player of the NFL in 1992 and 1994, and the MVP of Super Bowl XXIX. He is a member of both the College Football Hall of Fame and the Pro Football Hall of Fame. At the time of his retirement, he had the highest passer rating among NFL quarterbacks who have thrown at least 1,500 passing attempts (96.8), and is currently ranked third. Young also won a record six NFL passing titles. He is also still ranked highest amongst retired players. If you would like to book football speakers and NFL stars like Steve Young or Colin Kaerpernick for a speaking engagement, autograph signing, product endorsement, Super Bowl party, charity fundraiser or special event, you can request Colin Kaepernick’s and Steve Young’s agent and speaker fee details at SportsSpeakers360.com. For information on how to hire San Francisco 49ers players for appearances or call 1.855.303.5450.